Let's us focus on our christianity.I don't care about ye'hawelt" celebration menamen.We all should focus on our daily prayer and on Jesus Christ,St Mary ,Kidusan's(saint and Abatochachen).I think we shouldn't give attention for all nonsense matters.We ourselves are magnifying things for nothing and there is nothing which I learn for my soul from begashawe activity ,pbune paulos simet menamen.HODAM HULA!.NO PENNY TO THIS HODAM PEOPLES!!! Chiristianity is not all about myself! It is all about our fathers, mothers, brothern and everyone! We should focus on all the activities of our church! What our forefathers did, create us; what we will do will shape our successors! Therefore we should be concerened for everything in our church. The statue may be inagurated with a lot of celebration but who knows tommorrow it may be demolished with another celebration! what our history shows is like that. egiziyabiher kibirun enidimelis yeferesew kitir eniditades enitseliy. በስመ አብ ወወልድ ወመንፈስ ቅዱስ አሐዱ አምላክ አሜን !!! ምነው ታዲያ ለብዙ ዘመናት የኢ/ኦ/ተ/ቤ/ክርስቲያን ጠብቃና አስጠብቃ የኖረችውን አምላካዊ ቃል ብልና ዝገት በሚያጠፋው፣ ሌቦችም ቆፍረው በሚያገኙት በምድር ላይ መዝግብ ሳይሰበስቡ የለፉ እነ ቅዱስ ላሊበላ በሚያምርና በሚያስደንቅ ሁኔታ ያሳነፁትን ፍልፍል አብያተ ቤ/ክርስቲያን ስመ እግዚአብሔር ብለው እኔ ላሊበላ ሳይሉ የራሳቸውን ምስል ሳያቆሙ ያለፉትን እረ እንዲሁም ሌሎችም………….. ምንው ተረሱ ? አግልጋሎታችንን ለራሳችን ሳይሆን ክብር ለሚገባው በሰማያት መዝገብ ለሚመዘግበው ዋጋችሁ በሰማያት ታላቅ ነውና ደስ ይበላችሁ ላለው ለእግዚአብሔር ሊሆን አይገባምን ? ምነው ታዲያ በጎንደር፣በጅማ፣በኢሊባቡር የሰማዕታት አክሊል ለተጎናፀፉ የሰማዕታት ምልክት እንደ ወጉ እንኻን ሳይታወሱ፣ በተለያየ ምክንያት እራሳቸውን ያልቻሉ አጥቢያ ቤ/ክርሰቲያን በበዛት በአገራችን፣ አክራሪ እስልምና፣ ፕሮቴስታንት፣ ተሃድሶ እንዲሁም ሌሎችም በተለያየ ጎራ እየተስፋፋ በበዛበት ሁኔታ እንዲህ ያለ መሸላለምና መወዳደስ መደረጉ በእውነት መልካም እረኛ ነፍሱን ስለ በጎቹ የሚያኖረው እንዴት ነው ? ፍርዱን ለእግዚአብሔርና ለምእመናን ልተወው …………………..
500 አመት ድንቄም 500 አመት!!! ግን እስከዚያ ድረስ ይህ ርጉም ትውልድ በቤተ መቅደሱ እስከ ርኩሰቱ ይተዋል? It was better if it was done for the memory of the martyrs at JIMMA by moslems. So we have to mobilize our people in the diaspora and home city for public action. It is very amazing the paradigm shift of Dn. Begashaw from the strong opponent of Paul to devouted fan. The reason, however, is obvious. I am sure, he is doing this not out of his conscious, if he has. Very shame to him. Pls let's rebuke hin instead of apreciating him. yetewededachihu kiristiyanoch hoy minim dirgitu bebetekiristiyanachin sim mehonu biyanadidenim,bezih neger egna mesheber yelebinim . Bizu abinet honewun yalefu degag abew neberun ,zarem bihon alu, mayet kechalin , fireyachewun eyayachihu be eminet miseluchew ayidel yetebaliniw? tadiya migibarachew betekiristiyanin kalimesele abew silalihonu titen yemigebawun bicha memsel; yigebal.andach neger be eminetachin lay zilet mefeter yelebetim,yilikunis yebelete linitseliy ena lintega yigebal ,amlakachin betun enditadeg egnam endanitefa. Endenezih hod ader sewoch zare ayidelem mefeter yejemerut kidime lidete jkiristos enji. "ESKE MECHERESHAW YESENA ERSU YIDINAL"
GETA hoy ebakihin ende kifatachin bizat sayhon ende cherinetih dimtsihin aseman.......Dingil hoy ye asrat agerishin ebakishin gobgniyat.......be ewnet ye mekeru Geta be tsidik yemiseru agelgayochin yabzalin. may God sfeguard our CHURCH. In the name of the Father, the Son and the Holy Spirit One God Amen! Dear Dejeselam and all concerned Ethiopian Orthodox tewahido lijoch!! Today,we remember the day of Martrydom for Holy fathers saint Peter and saint Paul! We are their children who follow the teaching of our God, saviour, Jesus Christ! until death! We need to do something for our church before we are late! rather than just talk or gossip! I propose to all especially "Dejeselam" to form a petition to be submitted and a phone line to the Holysynod so that we all call call any of the members of the holysynod and request the Holy Synod to do something for our church, not just for this but for all the mess up going on or let us Know clearly that everything is beyond their capability. What are they doing their? where are our fathers? where are the sebakian? where are our children of God ? I call to them to face the truth and sacrifice for the church and for God, not for fame, money and social relations!!! All will be gone on the day we die but we believe as true christians we will get the reward of true believers after death!! Yetewahido lijoch hoy! behaimanot tsinu, betselot bertu, lezih lemialfew alem girgir atinberkeku! Amlake Petros woPaulos becherinetu betechristianin yitebikilin egnanim yadinen!!! seyetan bazegajew wetemed endanewesed eneteneken le hulum lib yisetew egizeabher yichen betekerestiyan yitebekat. Ewenetegna selehonech fetenawa bezu new demo be enaneyan sayihon fetenawa yemeberetaw berasewa agelegay, mere nen bayoch new. Christianity is not about ye abune Paulos Statue or ye'begashaw activity.It's about Jesus Christ!! !Most of these nonsense are DISTRACTORS for the growth of christianity.Spritual life starts from yourself.Ask who U are and then U will have a focus on yourself/your christianity ,and Then U'll stop talking/blaming more about others.Who are your forefathers?.Please leave them alone and if U were their sons,U would have followed their steps. There are a lot to be done in our church and we are fixated and kept on fighting for all nonsense things.Was there anyone who forced U to worship yeabune paulosen statue?.Hope U don't sacrifice yourself on fighting with NONSENSE!every one who is involved in churchs drama will be judged and punished by God.Please keep it simple and stupid!!! go to rural areas,pagans and those who never heard of christianity and spread the words of God,remember abunepaulos,BeGashaw and others in your prayers. Silebetechristain bilehe , sele me'emenan beleh, sile agelgilotih bileh yalehin tesatifo ahun bitinager melekam new! Hulachinim yeminawkew agelgilotih bezih medebizez yelebetim! Tenager! Tegager! tenger! Gizew zare new! Hulum Yalifal! Kibrum Yalifal! Mugesawim Yalifal! "Mot, Shiret be'beharyew le'lealebet Amilak Meskireh Teley!! Asawiken yalewin neger Bealaw Media hulu! THANKS TO GOD, HIS HOLYNESS DESERVES IT FOR ALL PROGRESSES HE DOES TO OUR CHURCH WOW IT IS A MILE STONE I AM HAPPIER THAN EVER . CONGRATULATIONS FOR THE PEOPLE WHO DOES ALL EFFERT TO MAKE OUR DREAM COME TRUE. Ebakachihu yemanawikew sire'ate betekiristian ke'al astemirun!!! endet Canona Betechristian endemiset tenageru meskiru!! Simeta, Kalun eyawoke lewondinu yalmesekere hullu yewondimun dem Egzae'bihere yiteyekewal! Kalu yetamene new! Egnam Bezih Enaminalen! Teraroch benawestu Be'Egzeabiher Yemitamenu Gin Ayinawotsum!! Endet Zare Lebetechristain Yemimotilat Yitifa, Lehigua lesiratua Yemimot Yitifa!! Ye! Debrelibanos Sema'etat Amilak, Ye!Ene Gelaudiwos Amilak Yiferedibinal! Mesenakeyawin Lemiyametaw woyolot Endal Geta Amlak! Zare yeltnager andebet, Zare yalmeseker Papas, Episcopos, kahin woim Miemene Neg Dida yihonal! Melise yelewuna!!! ለእዉነት የሚያስብ:እዉነት የሚናገር ና ለእዉነት የሚቆም ጳጳስ: የገዳማትና አድባራት አስተዳዳሪዎች:ሰባኪዎች የቢሮ ኃላፊዎ ና የሰበካ ጉባኤ አስተዳደር አባላት ባለመኖሩ ቤተክርስቲያን አሁን ሙታ ተቀበረች:: ከላይ የተጠቀሱት በደረጃ ከራሳቸዉ ጥቅም ይልቅ የቤተክርስቲያን አለመደፈርን ቢያስቀድሙ የታሪክ ተወቃሽ አሆኑም ነበር:: ከጅምሩ ቢቀጭ ኑሮ ከዚህ ዓለማዊ አሳፋሪ ተግባር አይደረስም ነበር:: በምህረት ዐይኑ የሚመለከት ልዑል እግዚአብሔር ፍርድ ይሰጣል:: ግን ሐዉልት መቆሙ ጽድቅ አይሆንም ልብስ መልበስ እና መስቀል መያዝም ቢሆን ከተወቃሽነት አያድንም:: "ቀኖቹ ክፉዎች ናቸዉ እና ዘመኑን ዋጁ"
To Sisay,Please make your mind.tell us any progress in our church other than division,complicated politics for past years.I know your dream is fulfilled after buying luxury car ,placing statue.What's your next dream? 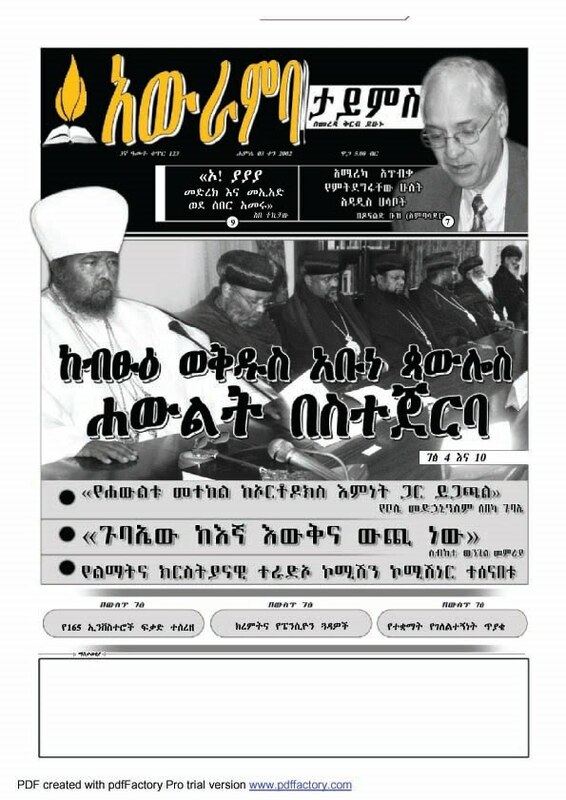 to organize abune paulos marriage???????? looking for him a beautiful girlfriend or i don't know.Do u think all these craps help our holy father to be on the right path?? ?.Please make your mind. Hello dear bro & sis we need to pray & cry towards God & His Sanits so that He will destroy it with lightning.Do not say any bad word i belive if we pray together God is near to answer. kesis Solomon erswo demo min nekawot,kehabtam gar mewal endih yaderigal ende lib yisitih.karkihn be 100 shih yegezahew "ageligay" ebakih tewen tewahdo eko meseretwa dem new atifersim minew mekina nedahibn zefenkibin..... bekah edimehn atasatirew. Meriwoch,yegna wutet nachew;tiruwoch kehonin Egziabher tiru Abat/meri yemaysetibet mikniat yelem.are enie ma-negn!yerasen hatiat meshekem aktogn...esti mejemeria rasachinin enastekakil,enimelis/niseha engiba;Egziabher yemiyadergewin enayalen,miknait felagiwoch bicha anihun;ke Israel hizib memar yigebanal.Egziabher yirdan.